Visiting us at Automechanika Birmingham this week? Home > Visiting us at Automechanika Birmingham this week? We’re looking forward to welcoming you this morning to our stand at Automechanika Birmingham. For the last few days, our team has been busy creating the EEC presence, and from looking around the various halls, there are many exciting reasons to be visiting. Visit us in Hall 18 Stand D51 and you’ll be able to learn more about our range of products available to the aftermarket, learn more about the technical challenges of the vehicle emissions system, and meet with our team to discuss how we can help find solutions for challenges in your business. 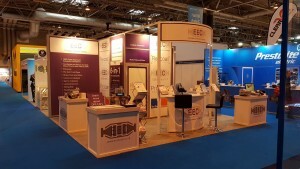 Automechanika is open today until the end of Thursday 8th June, at the NEC in Birmingham – you can read more details about the show by clicking here. We’re proud to today be launching our new 6-in-1 DPF Solution – a great added value upsell product for your customers that really stands out from the available solutions on the market today. We’re very interested to hear your feedback on this & you can click here to find out more on our website. If you’re visiting Automechanika Birmingham, we look forward to welcoming you to our stand.